It's not often that Alex St. James has a story this tantalizing fall into her lap, only to have it snatched away again. As news researcher at Midwest Focus Television in Chicago, she'd been set to interview a young Polish immigrant woman, pregnant by a Catholic priest. When the woman is found murdered, and Alex tries to investigate, her boss abruptly reassigns her to a fluff piece, so he can give the hot murder story to the station owner's nephew. But anyone who knows Alex also knows that, like fate, she'll find a way. Acting without authority and without assistance, she continues to investigate, making some very powerful people in the Chicago Archdiocese uneasy. 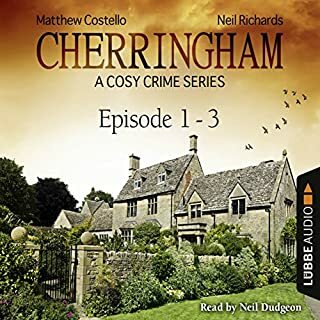 Suddenly Alex finds herself in the middle of a plot so sinister and far reaching that the very next thing she might hear are her own last rites. This work is about a reporter that gets way in over her head but unlike most books, there is no white knight to ride in and save her. It was a steady story without too much excitement but with enough intrigue to keep my interest. The narrator did an excellent job giving voice to the characters. I almost gave up on this because the beginning started off so slow. However, I'm glad I didn't. This was a very interesting story and fast paced story once the foundation was built. I have read other books by this author and also enjoyed them. 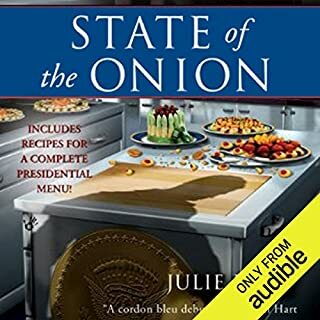 I hope the next book in this series is made available in the Audible library. One of my favorite authors, but this book was too negative for me. Not just the subject matter, but all the way down to the very descriptions she used. The ending was just as negative. I won't be reading the rest in this particular series of hers. "Deadly Blessing" is a great start to a promising new mystery series from Julie Hyzy. While the angle of a snooping reporter has been done before, Julie has kept it fresh and in the moment. Since it is the first book in the series there is a lot of character-establishing that has to be done, and that can slow the book down at times. It is well-handled though, and we end the book with a good feel for Alex's ethnic background (important to the story), personal motivations, relationships (past and possibly future), home, family, and work relationships. Alex as a mystery-solver isn't depicted as a super-sleuth. She isn't street-tough or world-wise (don't be fooled by the cover; there's no gun in her purse - at least in the first book). Don't take this as a negative - I hate it when writers make the mystery lead superhuman. She makes mistakes and doesn't always catch everything going on around her. What she is, though, is a determined investigative reporter who cares about people. It drives her to keep going when she loses her story, sees no way forward, and feels a sense of despair and danger (both personal and for others). I must say I loved Karen's narration for the book. She does a great job making you hear the sound of someone struggling with English when she does the girls from overseas without making it too difficult to understand. While it does slow down the narration somewhat it really worked for me in this situation. Beyond this her narration flowed smoothly and the characters stood out well. She even does a decent job with the male voices, especially her boss Bass. Overall I'd say "well done" for a start to this new mystery series - a solid 4 for story and 4.5 (almost my first 5-star rating!) for narration. If you like to plan for winter hibernation by stocking up on good mysteries to curl up with to pass away the long nights, I would highly recommend giving this one a shot. 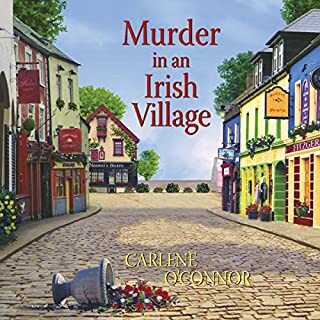 Narration - Karen Commins - Pretty Good. There's quite a few characters in this story and she does a pretty good job of differentiating between them all. She's a really good storyteller so the overall narration was engaging and very enjoyable. The story is a mystery that's pretty intricate and detailed. I found that I had suspicions, but for the most part, I was mostly wrong - or if I was in the ball park, it wasn't the right park. Alex is a tough investigative reporter who is smart and has nerves of steel. I really loved her character. I also enjoyed the way the mystery was woven in several directions. There's a bit of a catholic priest scandal so if that's not you're thing, this book isn't for you. I'll definitely continue with this series and based on other reviews, it looks like I will look into other books from this author. It's not often that Alex St. James has a story this tantalizing fall into her lap, only to have it snatched away again. As news researcher at Midwest Focus Television in Chicago, she'd been set to interview a young Polish immigrant woman, pregnant by a Catholic priest. When the woman is found murdered, and Alex tries to investigate, her boss abruptly reassigns her to a fluff piece, so he can give the hot murder story to the station owner's nephew. But anyone who knows Alex also knows that, like fate, she'll find a way. Acting without authority and without assistance, she continues to investigate, making some very powerful people in the Chicago Archdiocese uneasy. Suddenly Alex finds herself in the middle of a plot so sinister and far reaching that the very next thing she might hear are her own last rites. Although this book examines themes that have become popular over the last several years, it does so in interesting ways. While not a brilliant or unique book, this is a well written, well plotted and engaging mystery. The characters are nicely developed, an while there is a bit of type casting, that is alleviated by touches that give each character a definite, and believable, personality. This is not a full out action thriller, but does demonstrate how news stories are investigated, and, when there is action, it can become intense, especially the action just preceding the climax of the book. The writing is straightforward, but the author also demonstrates sensitivity and compassion, through her characters’ thoughts and words, that enhance the story and make it a satisfying read. Perhaps her villains are a bit too simplistic, and a little too villainous, without benefit of qualms or conscience, but then, at least one of them is probably a sociopath, if not a psychopath, so even this works rather well. 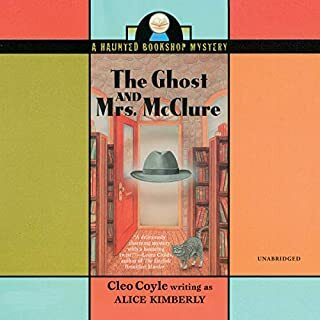 The narrator did an excellently professional job, and combines a pleasant voice with excellent pacing, shaping enunciation, and can handle foreign accents extremely well. This is a good, solid mystery, and a very enjoyable read. I give both book and narrator 4 out of 5 stars. I received this free book in exchange for this unbiased review via the courtesy of AudioBookBlast dot com. What did you like best about Deadly Blessings: An Alex St. James Mystery? What did you like least? This was a straight mystery with very few romance elements. It was a bit anti-climatic. What aspect of Karen Commins’s performance would you have changed? Her Latino accent was really bad, luckily, it was a short scene. Since I don't know any Polish, I'm not sure how well that was done. Do you think Deadly Blessings: An Alex St. James Mystery needs a follow-up book? Why or why not? No, it did not end with any threads open or a cliffhanger and I wasn't invested enough in the characters to care if I visited them again. Which character – as performed by Karen Commins – was your favorite? I had no extreme reactions although I thought that Alex's boss, her ex and the new reporter who is the owner's nephew as well as father Bruno were all A 1 jerks. Father Bruno was also a sociopathic scum bag. Alex is an investigative reporter who got bumped off a story of a murdered Polish immigrant who had been impregnated by her priest. The story was given over to the new news agency's owner's lazy whiny nephew who expects Alex to do his work. Alex stumbles on even a bigger story when she discovers that the Polish immigrants that father Bruno has been recruiting from Poland were being forced into prosecution. Alex almost gets herself and Sophie a young Polish woman whom she is helping killed in the course of her investigations. There is also some sparks flying between Alex and her co-worker William. Her annoying boisterous boss Bass is actually a decent fellow under his crude facade. This was a pretty good mystery thriller and an entertaining listen. The subject matter was interesting. Combining the Catholic church with scandal and prostitution, although not unheard of, made for an interesting read. This did not take the typical path of the primary female character and adding a handsome male character and turn it into a story about the relationship. I personally had a hard time with this narrator. It just did not feel like her voice matched Alex, the main character. I was expecting a voice that would be 'younger'. The part in the book that involved the dialogue with the prostitute who was Polish and struggled with English was particularly hard to get through. It is not that I thought the narrator was not good, just not a good fit for this book. This audiobook was provided at no cost for an honest review. Twists and turns keep you wanting to hear more. 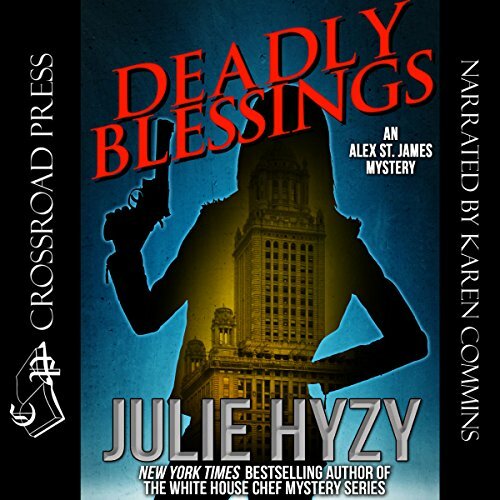 If you could sum up Deadly Blessings: An Alex St. James Mystery in three words, what would they be? Murder, prostitution, religious intrigue. It has it all. You wanted to discover more clues to see if you could solve the mystery on your own. What about Karen Commins’s performance did you like? Did well for so many characters to keep track of. It's sad that people capitalize on other people's crises for their own gain.